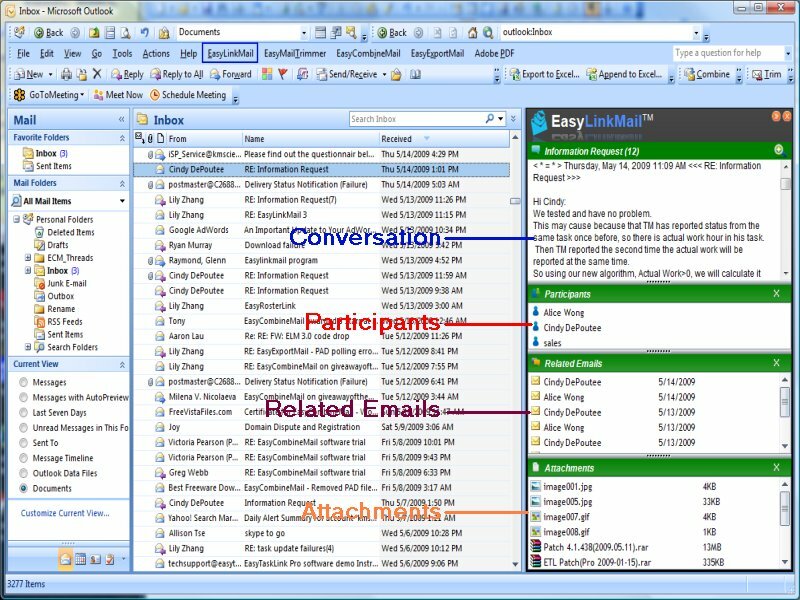 EasyLinkMail consolidates email events and converts them into real-time email conversations making email comprehension faster and giving instant access to related emails, attachments and participants. It can view all replies, forwards and CC's from all participants for the same topic emails into one. It makes easy to find out who said what and when from the all participants in just one single email that sorted in chronological order. View replies,forwards,CC's from all participants for same topic email into one. EasyLinkMail consolidates email events and converts them into real-time email conversations making email comprehension faster and giving instant access to related emails, attachments and participants. EasyLinkMail makes it easy to find out who said what and when from the all participants in just one single email that sorted in chronological order. Time is no longer wasted sifting through duplicates, forwards and multiple replies or having to manually reconstruct various email conversations. * What was said in a chronological sequence from both Inbox and Sent Items folders. * Who said it and when they said it. * Who is participating in the conversation. * List of related emails (original). * List of attachments that have been exchanged throughout the conversation. * Contact information for each participant. * View the combined conversation in text or full display format. Qweas is providing links to EasyLinkMail 2.1 as a courtesy, and makes no representations regarding EasyLinkMail or any other applications or any information related thereto. Any questions, complaints or claims regarding this application EasyLinkMail 2.1 must be directed to the appropriate software vendor. You may click the publisher link of EasyLinkMail on the top of this page to get more details about the vendor.